Classical Net Review - Fine - Blue Towers, etc. Summary for the Busy Executive: Nothin' could be finer. Most of modern American concert music – that is, the music written between the two world wars – derives from Stravinsky. To be sure, we've had our share of mavericks like Ruth Crawford Seeger, Henry Cowell, George Gershwin, Wallingford Riegger, Howard Hanson, Leo Sowerby, Alan Hovhaness, and early George Antheil, but the overwhelming number of our big names learn something from the Russian's neoclassicism. To a certain extent, American composers connect to Stravinsky's aesthetic through their studies with Nadia Boulanger – probably the person most responsible for the quick maturity of American music in this century. The aged Aaron Copland reminisced about the thrill that went through his younger, unknown self when he passed Stravinsky on a Parisian street and the pride he felt when, in the 1940s, Stravinsky remarked, "Why call Aaron Copland a great American composer? He's a great composer, period." 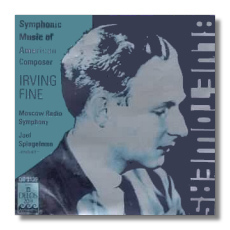 Irving Fine, a composer roughly contemporary with Bernstein and who died young, made his career in Boston and taught for many years at Harvard and Brandeis. He didn't write much and probably destroyed more than he published. Music of exquisite workmanship, however, survives. Unlike Barber, Bernstein, or Copland, he never had a hit, but like Walter Piston and Roger Sessions, he became a "composer's composer." To some degree, it's an unfortunate label, because it calls up in people's minds the evil bogeyman of the Academic Composer, out to destroy the Good, the Beautiful, and the True (in favor of the Bad and the Ugly) in music forever. Fine's music, however, is bright and beautiful, rhythmically exciting, argumentatively attractive and focused, and glittering in its colors. If you like Stravinsky's Pétrouchka or "Dumbarton Oaks" Concerto, you should have no trouble at all with Fine. Nevertheless, although Fine got much from Stravinsky, there's very often a personal element, deriving from American pop and jazz – highly sublimated, often just a turn of melody – that give his works a bigger, more open emotional quality than Stravinsky normally delivers. Around Fine's death in the 1960s, the Boston Symphony Orchestra released a recording of Leinsdorf conducting the Toccata Concertante and A Serious Song and of the composer conducting his own Symphony. This turned me on to Fine. As it happens, Fine also wrote some of the best American choral music – The Hour-Glass Suite (on poems by Ben Jonson), The Choral New Yorker, and a series of pieces on lyrics from Alice in Wonderland and Through the Looking-Glass – all of which I got to sing. The lack of any extraneous or unnecessary note marks his music, as does directness of expression – the mark not only of a great miniaturist, but of a composer with something to say. Much of Fine's output is in miniatures, but by the end of his brief life he had expanded the stage for his ideas. There's nothing miniature about the Symphony – a big, noble, passionate work that deserves a larger audience. It seemed to take Fine a long time to move from one to the other, however – under normal circumstances, a reasonable expectation – but Fine died young, just after he had, I think, really found himself. A violin concerto and an opera remained unfinished. "Blue Towers" – in Paul Moor's great phrase, "Fine's finer version of a college football pièce d'occasion" – immediately winning, with no condescension in craft, breezes along like an Isham Jones tune, full of big strides and open spaces within its three minutes. Music for Orchestra began life as Music for Piano. Joel Spiegelman, the conductor, orchestrated them. The little pieces are very Stravinskian indeed, borne out by the dedication to Nadia Boulanger. Spiegelman's orchestration emphasizes this, with colors coming from the "Dumbarton Oaks" part of the Stravinskian palette. Actually, the scoring is very close to the orchestral music Fine was writing in Forties (when he wrote the piano pieces). I congratulate Spiegelman on his ear and, paradoxically, on his imagination. He has not given us a "one-color-fits all" or the standard box of instrumental Crayolas, but an orchestration full of delightfsurprises. My favorite movement consists of a set of variations, especially the first one, a gorgeously singing andante, that shows, among other things, how Copland and Stravinsky connect. The subsequent allegro canonic duet between flute and oboe both delights and sets the blood racing. It is all too easy to speak glibly of Irving Fine's Diversions as a "charming" piece, and let it go at that, but in fact true charm is one of the most difficult things to achieve musically; and Fine has achieved it by simply and honestly revealing the man in the music. In those four brief pieces we can behold a personality: tender without being coy, witty without being vulgar, appealing without being banal, and utterly sweet without ever being cloying. Such a man (and such a work) is rare enough to cause rejoicing. The four movements – "Little Toccata," "Flamingo Polka," "Koko's Lullaby," and "The Red Queen's Gavotte" – show how far Fine had developed his own voice by 1959. This sounds as much like Stravinsky as, say, Walter Piston does – influenced, but not dominated. "Flamingo Polka" and "The Red Queen's Gavotte" demonstrate the strong attraction of the Lewis Carroll books on Fine's creative impulse. There are lots of Alice pieces. Koko, a French poodle, held the job of family dog. The gavotte, my favorite movement (the toccata delights as well), leaps out of the miniature to something grand – paradoxical, because you realize the satiric intent. Call it Fine's big nature or his superb taste, something transmutes the grandiosity to an emotion, big and genuine. This music could accompany Quixote. Toccata Concertante represents the apex of the Stravinskian Fine, and (with Talma's Toccata for Orchestra) it's one of the great masterpieces of neo-classicism, and not just the American branch either. Throughout its 11 minutes, it shows a composer really grappling with the problem of expanding the emotional range of neo-classicism while exhibiting formidable logic and craft. The entire work grows from one very arresting idea. It has nothing to apologize for, even in the company of Stravinsky's Symphony in Three Movements and Symphony in C. It blazes, it smokes. I sometimes wonder how Fine (and several other composers) could have refined their craft to this extent without the support of Koussevitzky and the Boston Symphony. At any rate, I prefer the performance of Leinsdorf and the Boston Symphony Orchestra (as far as I know, not currently available) to that of Spiegelman and the Russians – more driving and sharply-articulated, more brilliant in tone – although the high quality of the work comes through in both. Even Stravinsky felt the need to move on and began – in the Forties, as early as the Sonata for 2 Pianos (a wonderful piece, not very well known) – a long rapprochement with the serialism of Schoenberg and Webern. When he made the complete break with neo-classicism in the Canticum sacrum (1955), he upset quite a few composers who had taken up hard-line opposition to serialism. Some openly talked about betrayal, as if an artist could do anything he wanted, rather than what he felt compelled to do. The more sensible composers ignored him, moved with him, or (in the case of composers like Thomson and Bernstein in certain works) assimilated some of the serial aesthetic into predominantly tonal, neoclassic compositions. Fine produced pure serial works somewhat earlier (the dodecaphonic String Quartet appeared in, I think, 1952), although, as we have seen with the Diversions, he continued to write neoclassically as well. Fine's Symphony represents his most extended work in the serial vein. I know that once I mention "Schoenberg" or "serial," most people will just shut me off. But it's Schoenberg with a difference. I'm convinced that it's not Schoenberg's atonality that puts people off, but his rhythm and phrasing, derived from post-Tristan habits of melody and orchestration. If you didn't know Fine's symphony were serial, I doubt it would occur to you. The thing dances. The "Capriccio" second movement drives as much as the Toccata Concertante. Throughout the symphony, the gestures are sharp and memorable, the rhythm clearly defined, as opposed to the aural slough of boops and squeaks most people think of when they think of atonality. It's Schoenberg with a difference. Fine hadn't wasted the years spent with the ballet-master Stravinsky. What the change seems to do to Fine's music is open it up emotionally, to make it more passionate by removing the little ornamental hedgerows of neo-classical galanteries. The hardest movement is the "Ode" finale, but it also plunges the deeps. The ideas appear with such definition, the listener tends to retain them. Fine even manages to end nobly – something most serialists find hard. I don't believe you need know anything about the dodecaphonic method of composition to recognize and respond to the magnificence of this finale. Spiegelman and his radio Muscovites live up fully to the technical and interpretive challenges of this work – singing in the "Intrada" first movement, sharp and even insouciant in the "Capriccio," near-epic in the finale. It's by far the best performance on the CD – appropriately, because it's the finest work on the CD – and improves significantly on the composer's own reading with the Boston.